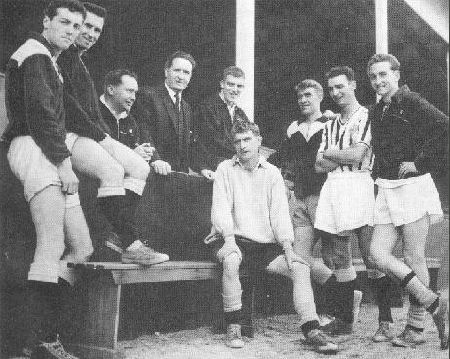 Having captained Dunfermline Athletic, won the Scottish Cup, played in the club`s first European matches and then managed the club, George Miller clearly played a massive part in the history of The Pars. Born in Larkhall just before the outbreak of the second world war, George was signed by then Dunfermline Athletic manager Andy Dickson in the summer of 1959. It was his professional club having signed from Royal Albert. A near ever present in his first season, he scored his first goal for the club in a 4-1 away win at St Johnstone in the Scottish Cup. However, the club was struggling in the league and Andy Dickson resigned with just six matches remaining. A certain Jock Stein took over and won all six remaining matches under his stewardship, saving the club`s first division status into the bargain. The following season (1960/61) saw Miller again play a huge role in a side which began the decade in remarkable form. The Scottish Cup success that season was the club`s first major silverware, and George Miller was at the heart of it. He again managed to score along the way, getting a 90th minute goal in a 6-3 away win at Aberdeen. Miller actually played in all eight matches that ended with a final replay win over Celtic at Hampden Park, and legends were made. European football was the result, and the young Miller was part of the team that made it`s debut on the biggest stage of all. Having reached the quarter final of the European Cup Winners Cup in his first European season, Miller played a huge role in the tough draw that saw Dunfermline up against English giants Everton in the opening round of the 1962/63 Inter Cities Fairs Cup. Having lost the first leg 1-0 at Goodison, a huge crowd of nearly 22,000 packed in East End Park for the midweek return. Miller helped stoke the atmosphere by scoring his first European goal for the club after only five minutes, and Dunfermline went onto win the second leg 2-0 and therefore progress. Miller the defender managed to wade in with more than his fair share of goals over the years, eight in 1961/62 being his best ever return and part of twenty four he scored for Dunfermline in all competitions. He also appeared in 13 of the club`s European matches before English giants Wolverhampton Wanderers came calling with a then huge bid of £28,500. Dunfermline (perhaps reluctantly) accepted the offer and Miller tried his hand in the English top flight. Just over a year later however, Miller was heading homeward again and joined Heart of Midlothian at the age of 26. An iconic image saw Miller leading his new side out at Hampden Park for the 1968 Scottish Cup final alongside Dunfermline captain (and former Hearts player) Roy Barry. Shortly after the defeat in that cup final, Miller moved onto Falkirk where he saw out his playing days until 1972. When Alex Wright was sacked as Dunfermline manager, Miller made a return to his first professional club where had enjoyed so many happy times as a player. He guided the side to promotion in his first season in charge, as runners up in the old second division. The side was a shadow of the successful team from the sixties and was reliant upon youth coming through the ranks. Miller oversaw the mixture of youth and experience that included young stars such as Jim Leishman, Dave McNicoll, the prolific Graham Shaw and Kenny Thomson. After a poor start to the 1975/76 season, Miller resigned and soon after joined Falkik as their manager. A later spell behind the scenes at Hamilton Academical was Miller`s last full time involvement in the game. It would be fair to say that Miller`s most successful times as both a player and manager came at Dunfermline Athletic however. He was rewarded for his time at the club when inducted into the club`s Hall of Fame in 2005/06 season alongside Jim Leishman who always saw Miller as his mentor in the game. After suffering from ill health, Miller has now passed away at the age of 69 and it goes without saying that every Pars fan young and old will wish his family and friends their sincere condolancies at this time. Further tributes will no doubt follow from the club who has lost one of its finest servants over the years.